It’s summer which means plenty of opportunities to take your speech therapy session or your kids outside for Playing With Purpose. Now here in Texas, we’ve got temperatures rising above 100 degrees but some days my clients and I need a change of pace. So this week we are stepping outside for part of our sessions and playing with sidewalk chalk. 1. Draw a target and practice speech sounds. I got this idea and frankly the inspiration for this week’s blog post, from Sarah Lockhart, MS, CCC-SLP in Ashland, OR. Use your sidewalk chalk to draw a target or bullseye on the pavement. I drew mine with four circles. Inside the smallest circle I wrote 10, then 5, then 2 and a 1 in the largest, outer ring. Next, have your kiddo stand back and throw a ball, rock, coin, etc. at the target. If the rock lands in the ‘2’ circle then the child will say their sound two times. Adjust this for whatever level your child is at–word, phrases, sentences. 2. Play hopscotch and practice speech sounds. This is a variation on the tip from above and another great use of sidewalk chalk. Start by drawing a hopscotch board on the pavement. (FYI, if it’s rainy or not great outdoor weather where you are then you can do this inside with masking or painters tape on your floor.) 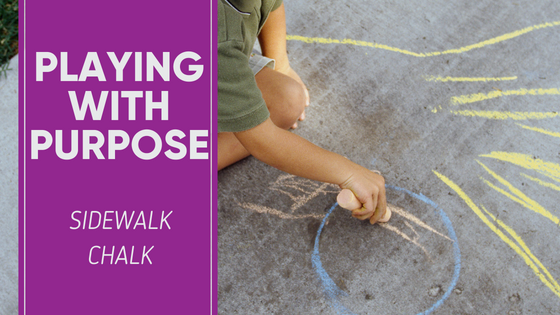 Then use your sidewalk chalk to draw pictures of words that include your child’s target sound, write individual words, or write numbers in each space. Drawing pictures is an excellent way to use this activity for young children who are not reading. 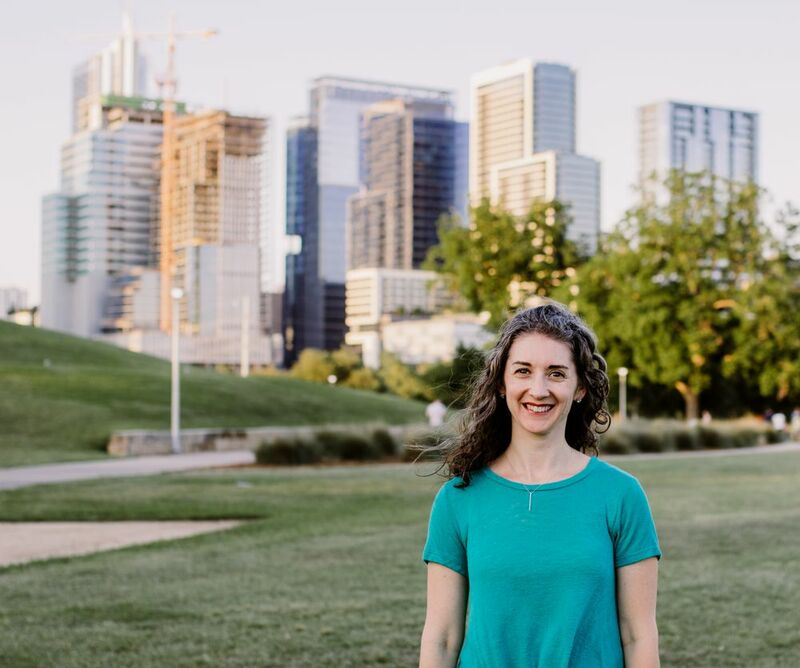 I write words for my older clients so they can read, and then even use their target word in a phrase or sentence. Both reading the words without a model and then formulating a sentence is an extra level of complexity that is a strategy to use with kids who are working on carryover. 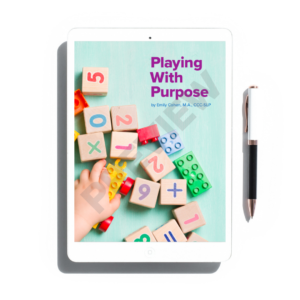 If you’re like me and have forgotten how to play hopscotch, then read this from Playing With Words 365. 3. Create a game board and work on following directions. I found this activity from Speech Therapy Fun, and it includes FREE, printable following directions cards. To start, you’ll need red, blue, and green sidewalk chalk. Draw a game board, in any configuration you want, using rectangles, circles, stars, squares, triangles, and hearts. Be sure to include at least one shape in every color. 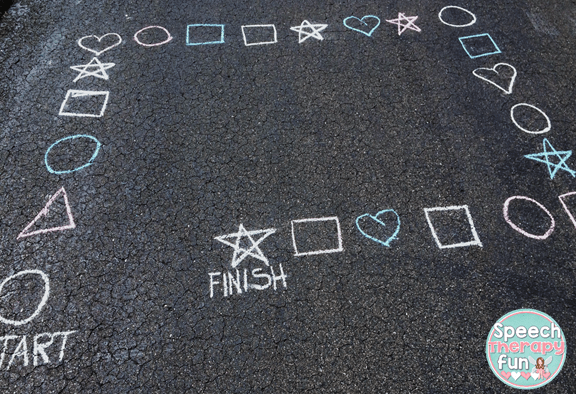 I draw a starting spot and a finish line to set expectations and have clearly defined boundaries, which are helpful for children. Then your child or client can pull a card from the deck and follow the directions on it. Play along with him/her for increased engagement and to model concepts that may be more challenging. 4. Work on associations or categories by drawing pictures. To start, I say a word or draw a picture of an object using my sidewalk chalk. Then the child has to draw the next item. If we are working on associations or ‘go-togethers,’ then I may draw a web, and my client would (hopefully) draw a spider. If we were working on categories, then I would start by drawing an apple and a banana with my sidewalk chalk and hope the child would draw another piece of fruit. Don’t worry if you’re not an artist; I promise your client or child will not care. They are just excited you’re down on the ground and engaged in a new activity with them. 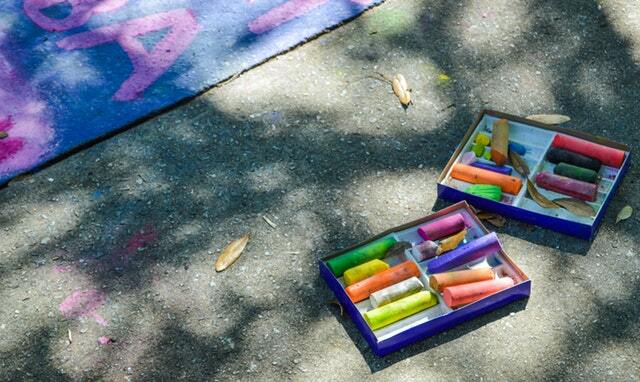 Now you are ready to hit the pavement and get creative in Playing With Purpose using sidewalk chalk. Remember movement and getting outside are fantastic catalysts for learning in our children. Have fun chalking it up with your kids and clients!